The Chevrolet Camaro is an impressive machine, and so are the people who love it – innovative, and who won’t settle for anything lees than exactly what they want in a vehicle. Even the very first Camaro, released in 1967, featured an optional power-operated convertible top for just over $50 extra – an option chosen by almost half of the nearly 100,000 initial consumers. Now, in 2016, Camaro drivers don’t even have to slow down to raise the convertible top – which can automatically raise even at speeds up to 30 mph. Clearly, Camaro owners are willing to go all out on their luxury vehicles. This culture of not settling for anything less than the best has continued to today, evident in the amazing options available on the new 2016 Chevrolet Camaro. This sixth generation offers a stunning refresh on an already dominant line of sporty performance vehicles – the perfect offering for the driver in search of a seamless combination of stylish form with top-quality performance. This model features a nearly complete overhaul from the previous generation, with a fully redesigned, stiffer lightweight architecture that boasts sleeker aerodynamics focused on performance over appearance – not to say it doesn’t look even more impressively stylish than before. Plus, this model is over 300 pounds lighter than its predecessor, improving handling and making this model exceptionally nimble on the road. 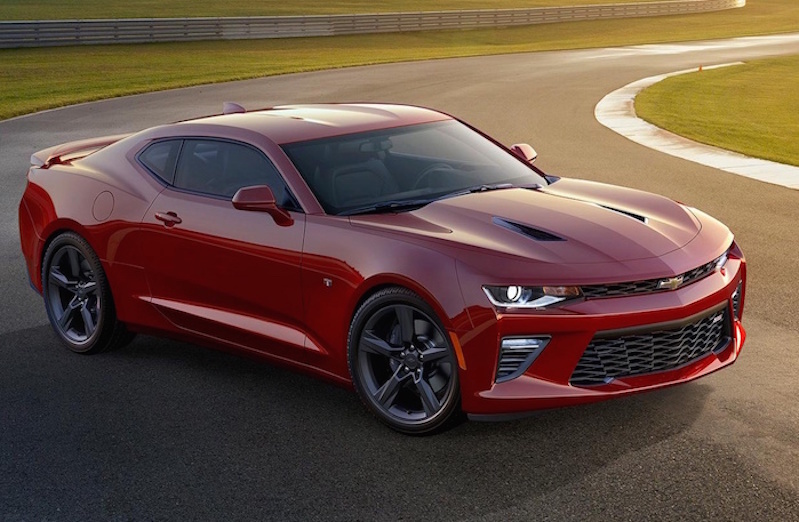 The 2016 Chevy Camaro comes in a hardbody coupe and a sleek convertible, with a top designed to mimic the look of the coupe and which can fold completely under the belt line under a hard folding tonneau. With all this, a driver can transition to convertible driving without losing even an ounce of style – not to mention time and effort. Standard 18-inch wheels and Goodyear Eagle Sport all-season tires maintain excellent grip on the road while keeping in with the stylish good looks of this new Camaro, while the RS package’s 20-inch wheels and Goodyear Eagle F1 Asymmetric all-season run-flat tires promise even better handling on the road at any time of the year. And with available Brembo brakes paired with the standard all-aluminum wheels, stopping will be nearly as exciting as accelerating in this powerful model. Welcome to the 2016 Camaro’s command center, the driver-centered cabin featuring sculpted accents and a smooth finesse that seem to define luxury. A flat-bottomed racing style steering wheel, an innovative shifter placed in an instinctive position, and high-performance seats give this model an exceptional race-ready feel, while lines of interior spectrum lighting in 24 available colors converge around the center console create an exceptionally modern environment. For ultimate driver comfort, contact points like kneepads and elbow pads are coated with soft, premium trim that only add to the racecar-style feeling of the cockpit. Specially constructed air vents regulate cabin temperature and airflow through rotational rings to optimize performance while maximizing efficiency. And, as expected, available 4G LTE Wi-Fi throughout the cabin keeps you and your passengers connected and chatting, streaming, and reading no matter where you are on the road. Plus, passengers can access all of these services through the standard 7-inch or available 8-inch touchscreen center display. This display comes with Chevy’s MyLink infotainment system, with Bluetooth connectivity, streaming music through Pandora, and over 20 other sources of entertainment and information. With basic luxury amenities like an integrated lap timer and wireless cell phone charging mat available in the dash, the 2016 Camaro simply screams modernity and luxury for the 21st century. Inside every Camaro, there is a beast waiting to be unleashed. Specifically, one of three – each a member of an exclusive line of high-performance powertrains that help give the Camaro its legendary reputation for ultimate race-quality driving. The standard option for the 2016 Camaro is Chevy’s supercharged 2.0-liter turbo four-cylinder, capable of a surprising 275 horsepower and an impressive 275 lb.-ft. of torque. Even for the most basic option, this engine still promises an excellent driving experience, 0-60 acceleration in just 5.4 seconds, and superior handling for an already tight and easy-to-maneuver model. Surprisingly, this supercharged little piece of machinery matches the output of the 1993-1995 Camaro Z28’s 5.7L V-8 – and offers comparable acceleration performance. If that’s not a testament to the progress Chevy has made on this exceptional line of vehicles, then nothing is. Some, obviously, need a little bit more power under the hood – and the Camaro has an option for that. Meet Chevy’s 3.6-liter V6, a powerful force to be reckoned with that combines 335 horsepower and 284lb.-ft. of torque with direct injection with variable valve timing. When paired with the available eight-speed automatic transmission, this engine also comes with available Active Fuel Management to boost fuel efficiency during periods of high performance. And then there are those who never settle for anything but the best; those who know they want unparalleled performance and are willing to go the extra mile-and-a-half to get it. For these people, there is the 2016 Chevy Camaro SS. This is the ultimate version of an already unbelievable car. The first ad most noticeable improvement is the 6.2-liter LT1 V8 small block engine, capable of roaring out 455 horsepower as well as 455 lb.-ft. of torque. Complete with functional and muscular vent fans on the front hood to keep the engine cool as well. All this, plus Eagle F1 Asymmetric 3 run-flat summer-only tires, make the SS the ultimate 2016 Camaro model for the serious racing enthusiast who won’t budge an ounce in the name of style or performance. With standard Brembo brakes, there is little the SS is left wanting to improve performance. For all trim levels, the spread of three driver-selectable driving modes – Snow/Ice, Tour, Sport, and an additional Track on the SS model – will activate different sounds from the dual-mode exhaust, letting you and everyone else hear for themselves the raw power of your Camaro’s engine. As you can see, it’s no surprise that the 2016 Camaro won its first Car of the Year Award from Motor Trend magazine this year. If you’re convinced of the awesome power of this stylish and sporty machine, head over to DePaula Chevy and get a great deal on one of these amazing cars today.